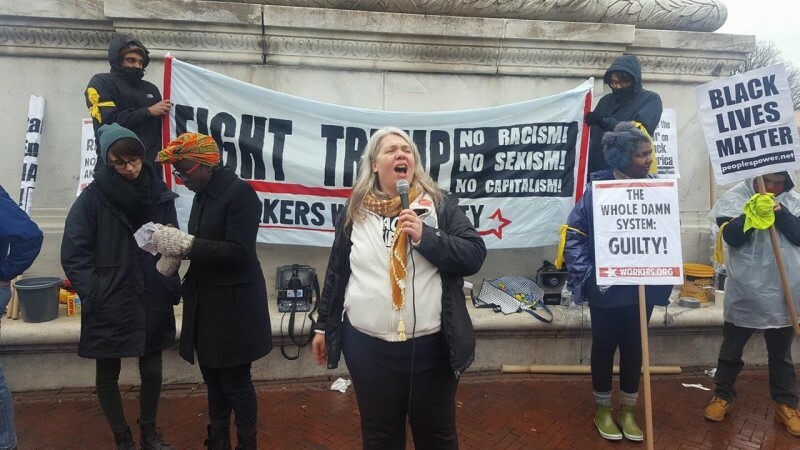 FRSO leader Steff Yorek condemns Trump signing of sanctions bill | Fight Back! Minneapolis, MN - President Trump signed a U.S. sanctions bill against Russia, Iran and the Democratic People’s Republic of Korea (DPRK) on August 1. In a hostile move, both the U.S. House and Senate voted by large majorities to target the oil and gas industries of Russia, the space and nuclear industries of Iran, and the international banking and financial institutions dealing with the DPRK. Yorek continued, “The hypocrisy of Wall Street, Congress and the corporate media is plain for all to see. All they can talk about is how Russia interfered in the U.S. elections, while the U.S. interferes openly in the elections of Ukraine, Venezuela, Honduras and many other countries. The U.S. funds and arms far-right and even fascist groups, shares intelligence with rich politicians to overthrow elected leaders, and then lies about election results in those countries, while claiming to spread democracy and freedom. “As every person in the Middle East knows, U.S. sanctions lead to war. Russia, Iran and the DPRK are responding by gathering their friends and allies, and preparing for self-defense. As Russia, China and others are working together more and more, many are welcoming the opportunity to end the poverty, misery and war the U.S. brings to their countries,” Yorek concluded.